Barbara Alfaro is a graduate of Goddard College and the American Academy of Dramatic Arts. She is the recipient of a Maryland State Arts Council Individual Artist Award for her play Dos Madres. 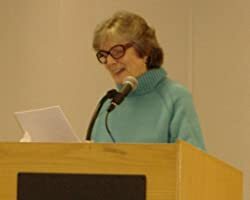 Her poems and essays have appeared in various literary journals. Mirror Talk, her memoir about a Catholic girlhood and working in theatre won the IndieReader Discovery Award for Best Memoir. Barbara and her husband Victor live on the Eastern Shore of Maryland. Please enter your email address and click the Follow button to follow Barbara Alfaro! A well-read robot, an overweight ghost, and a redheaded avatar as well as ordinary mortals looking for love are all here in this quick, fun collection of humorous short stories by award-winning author Barbara Alfaro. First love, a summer carnival, a stranger on a bus, a child ghost, and other memories are recalled in this chapbook edition of poems by award-winning author Barbara Alfaro. Even as a child, poetry owned the poet's heart. Clearly, it still does. A fairy tale about a kind king, a witch's spell, and a boy who stammers but never hesitates when it comes to courage.